It’s no secret that kids LOVE helping in the kitchen. Whether it’s helping to mash the potatoes for dinner, or mixing the batter for a cake, they are only too happy to roll up their sleeves, wash those little hands and get stuck in, right? It fills them with a sense of pride, accomplishment and excitement for the day when they can cook and create all on their own. 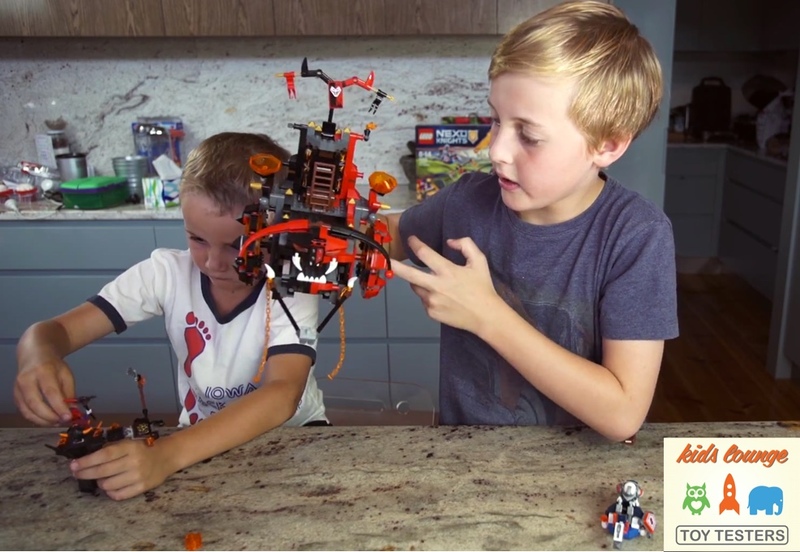 Well, thanks to White Wings’ new Make & Create™ range that day may come sooner than they ever hoped! 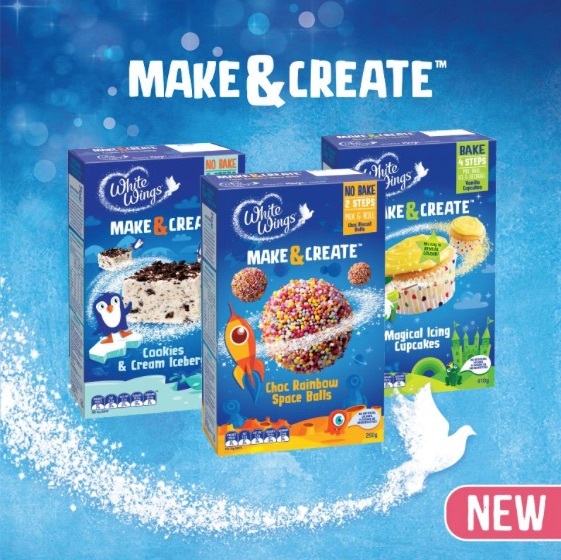 Make & Create™ is a fun range of mixes specifically created for kids, offering three fun and delicious treats that they can make at home on their own. Parents will also be pleased to hear that these fun kits don’t have artificial colours, flavours or preservatives. 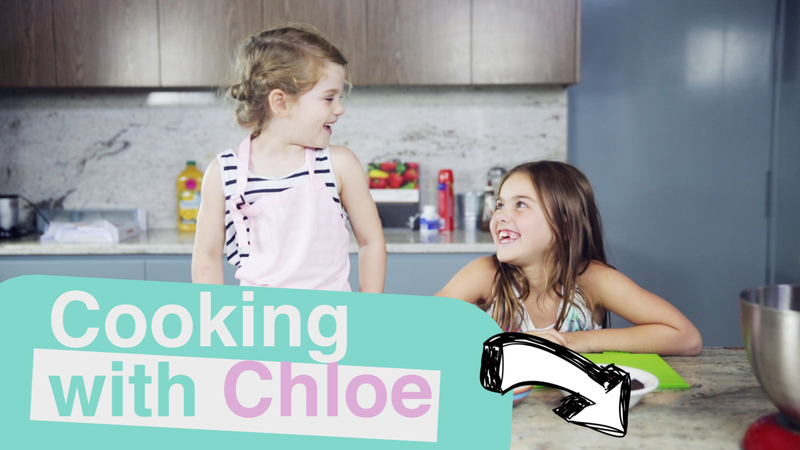 Watch Kids Lounge Toy Testers Chloe, Kurtis and Chelsea getting creative in the kitchen with White Wings Make & Create™. Get ready for some serious cuteness overload! The range consists of Chocolate Rainbow Space Balls, Cookies and Cream Icebergs and Magical Icing Cupcakes. Each packet clearly states the level of difficulty, and how many steps are in the process so parents can easily determine a suitable kit for their child’s ability. This no bake kit makes 12 yummy, chocolate biscuit balls which taste out of this world. This super easy no-bake kit doesn’t require any extra kitchen utensils. Kids just need to mix and roll. 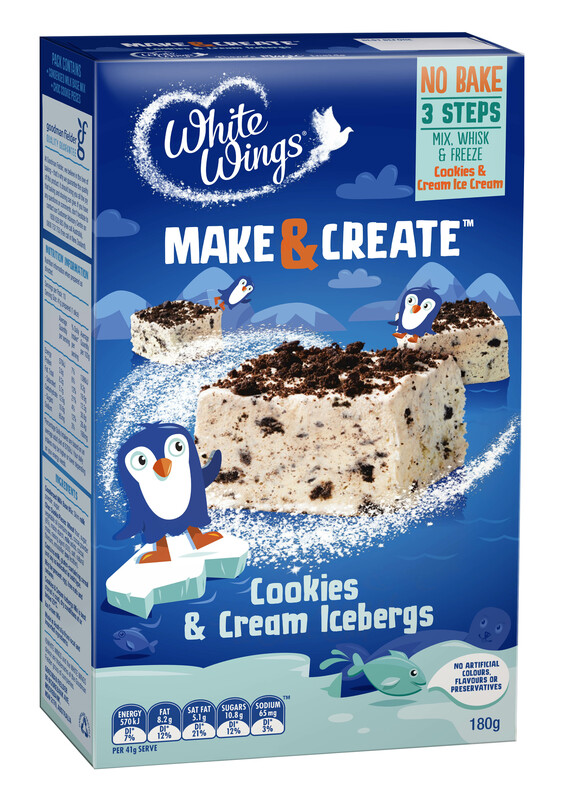 These Cookies and Cream Icebergs are the first ice cream mix in the category. This kit is no-bake and only involves 3 easy steps including mix, whisk and freeze. 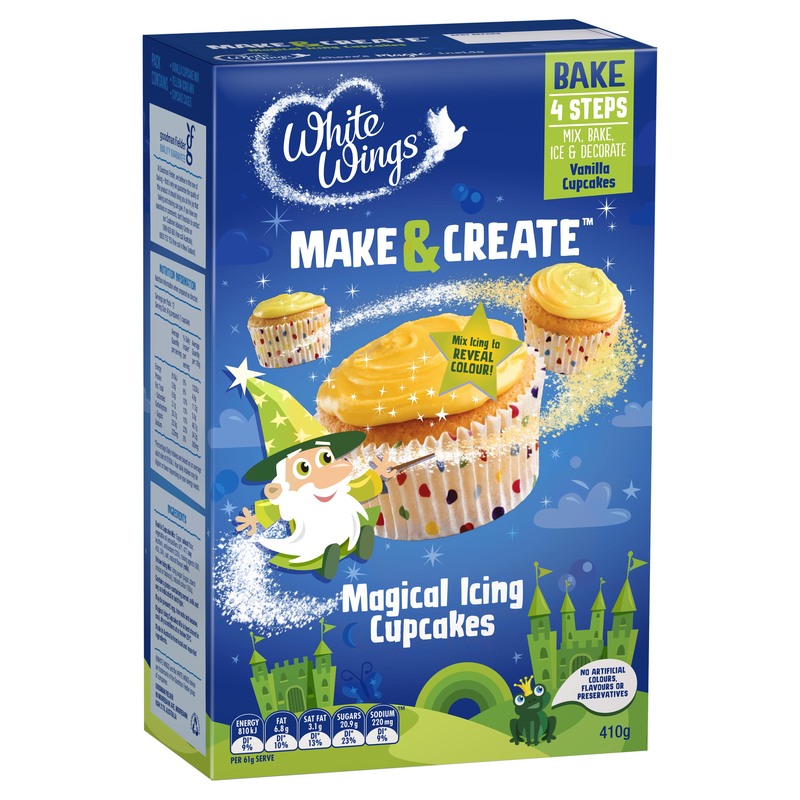 The Magical Icing Cupcakes are for older kids and require parents to supervise their child as the cupcakes do need to be baked in the oven. Kids will love whipping up these 12 delicious vanilla cupcakes with a bit of magic…just mix the icing with water to reveal the colour! Waiting for their creations to be ready to eat can be a tedious process for kids. (And being asked every 2 minutes if it is ready yet is equally tedious for parents, am I right?) Which is why it’s fantastic to see that White Wings have taken this into consideration too. 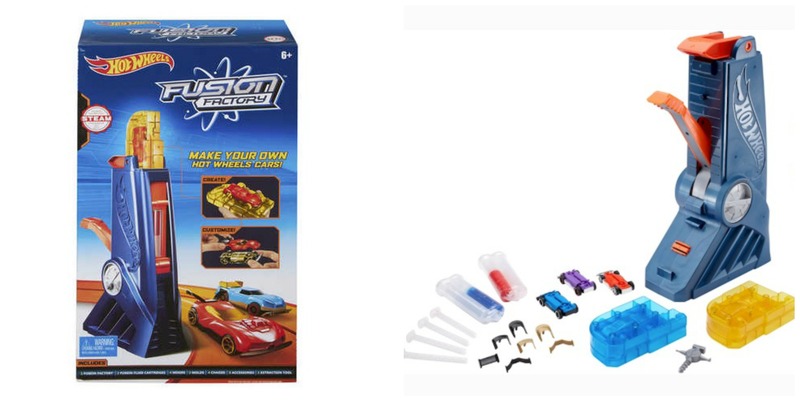 The back of each pack features fun activities that your child can engage in whilst they are waiting for their culinary masterpiece to set or cook. 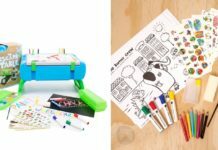 More fun downloadable activities are available on the White Wings website – for hours of fun! 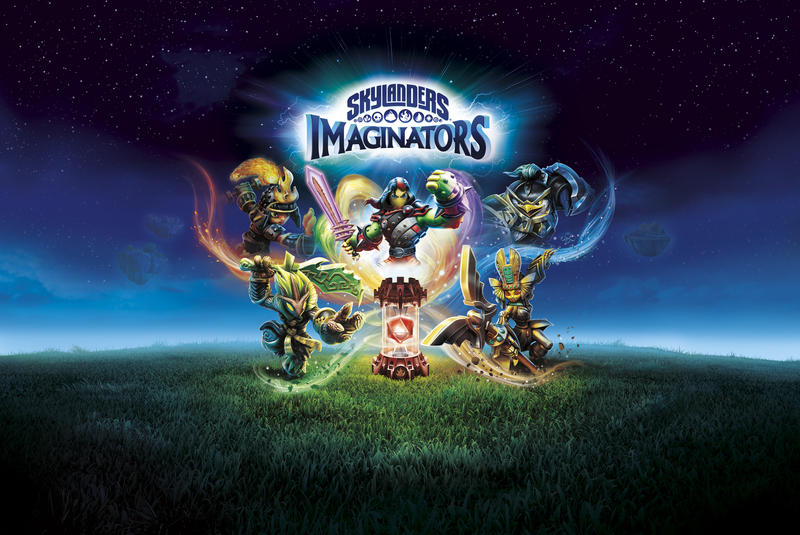 Check out the video above to see how much fun our Toy Testers had doing the White Wings crafts! The Kids Lounge Toy Testers’ verdict was unanimous! They had an absolute ball with the White Wings kits, and their parents also noted the other incidental learning they did along the way (namely counting, reading or following instructions, taking turns and sharing). All of our testers were clearly very proud of themselves and their creations and their parents were pleased to note the obvious confidence boost the activity had given their child. They couldn’t wait to show and share their tasty treats with family and friends. 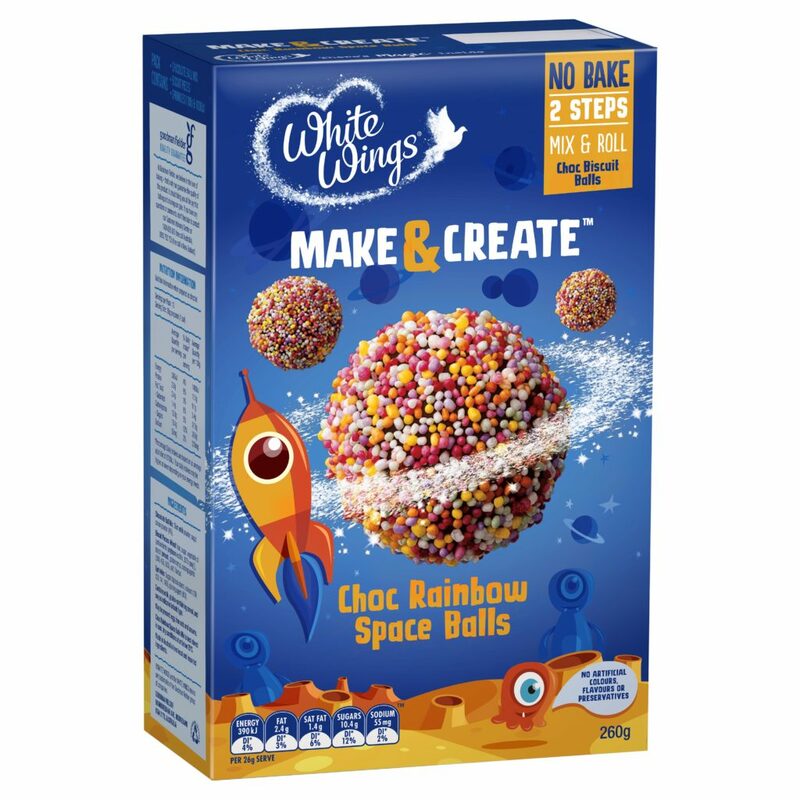 For the very reasonable price of just $5 RRP we give the White Wings Make & Create™ range a double Mums Thumbs Up as an awesome activity with children aged 2-10 years old. We’d love to see what happens when you unleash your little chef in the kitchen and let them take control of the fun! Previous articleWhen Should We Allow Children To Use Public Toilets Unattended? 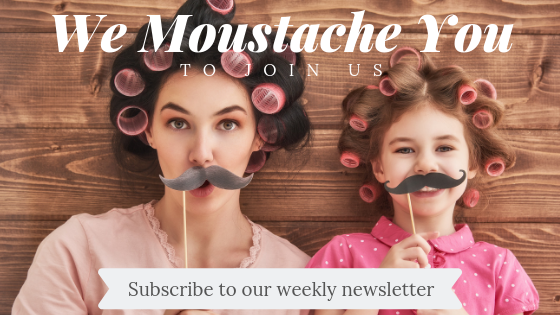 Next articleSo It Turns out That Kindergarten Homework Isn’t as Easy as We Thought!